Outside of Klang however, I have countless disappointment with BKT outlets claiming to be the ‘authentic’ Klang bak kut teh, or the BEST bak kut teh, or whatever else they conjured up with. So far, the only ones noteworthy outside of Klang are Yap Chuan in Puchong for their irresistible dry bak kut teh, and Ah Sang Bak Kut Teh in Sungei Way. And no, I did not enjoy Jalan Ipoh’s Ban Lee or Fatty’s on Old Klang Road. But now … there might be a piece of good news. 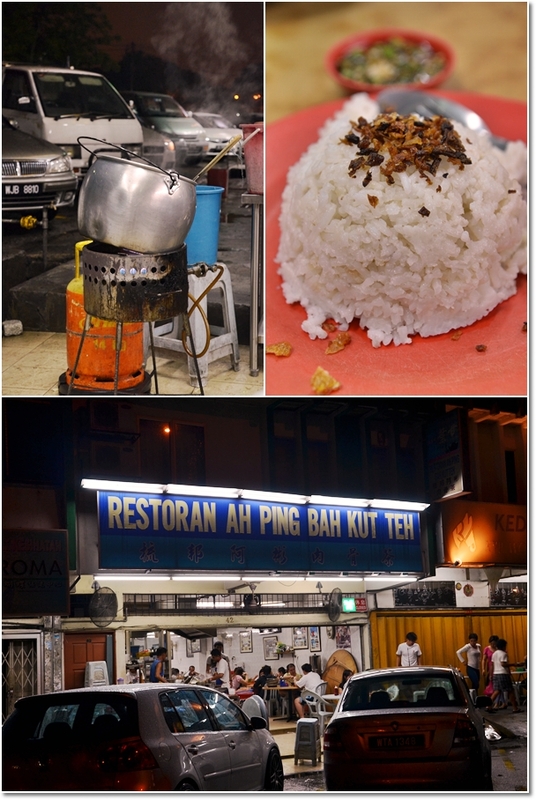 A saving grace in the form of Ah Ping Bak Kut Teh in SS14 in Subang Jaya. I have passed by this area a few times, dropping by for Kar Heong for Ipoh’s ‘kai see hor fun’, Well Cook Gourmet for their fried laksa and various noodles, and bearing the intention to try Wong Soon Kee‘s crazily popular nasi lemak with fried chicken yet failed miserably every time. Ah Ping usually would be packed to the brim, especially if you come on a rainy evening or during peak dinner hours. 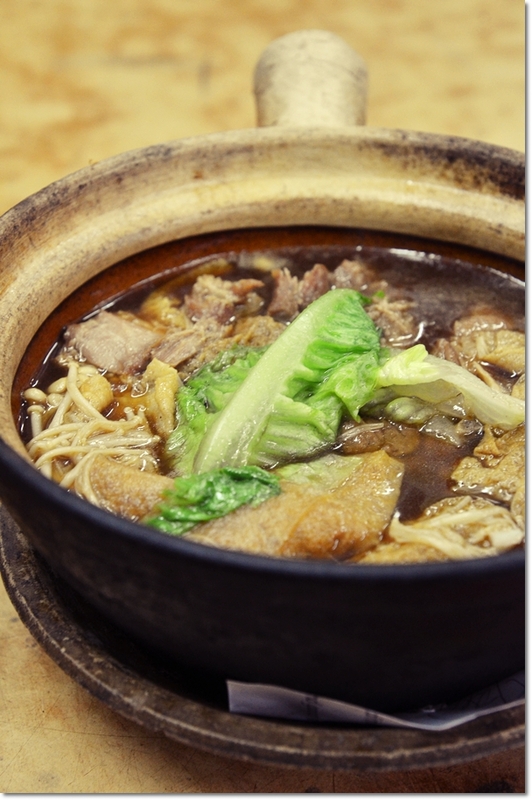 Finding a seat can be a slight hassle, but they work in such a speedy and impressive manner, you’d be thinking whether did they prepare your Bak Kut Teh 5 minutes before your arrival! Apparently, the owner learned the ropes from his brother who has had experience serving Bak Kut Teh in Teluk Pulai of Klang back in the 80’s. Then Ah Ping himself started this restaurant in during the late 80’s and the rest … was pure porky history! 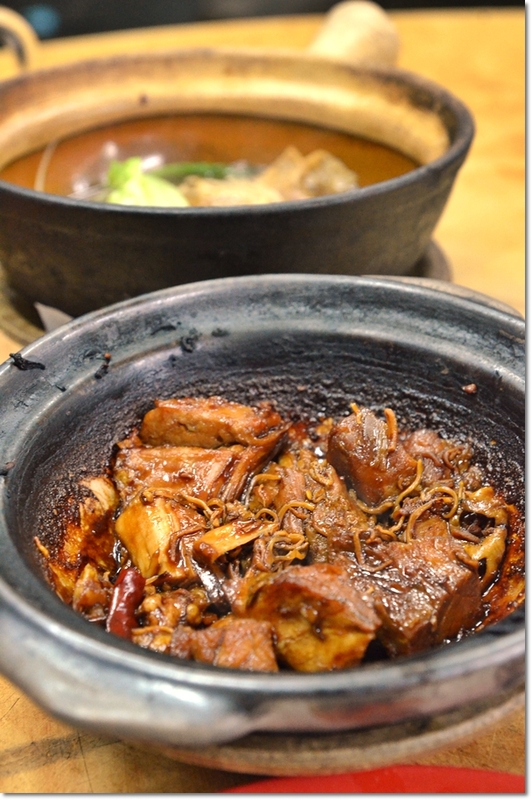 They serve two versions of bak kut teh; the soup version in claypot and the dry version coated in a sticky sauce with a balance of savoury and sweet flavours; lightly permeated with a slight briny hint from the dried cuttlefish bits cooked within. This dry version of BKT clearly is not their forte, paled in comparison to their soup version. Served bubbling hot in a claypot, the serving came with optional golden mushroom (enoki), and sheets of beancurd (foo chook) and an awkward piece of lettuce. I specifically ordered lean meat this time around, to lessen the guilt after repeated bouts of indulging as of late. Blame it on the stress factor. The soup version was a winner in my books, comparing this to similar outlets in KL and PJ. This was even better than my last visit to Teluk Pulai BKT last month! However, the soup here may carry a relatively faint hint of herbs, thus may not appeal to those in favour of fragrant and thick brew (a common trait of original Hokkien BKT served in bowls). I have not tried this particular shop as most of the time, I’d go to Yu Kee Bak Kut Teh which was recommended by my friend. It’s somewhere a block away from this shop, I think. Their BKT is pretty good too. Give them a try if you’re in SS14 again. btw, there are quite a few BKT shop at the same row, got 1 at the corner shop, many gals last time like to go, because 1 of the staff there very handsome…as they say…. Haha …. I prefer Yap Chuan’s dry one to their soup version though. haha, feel free to ajak makan when you’re in subang lah… i usually have my bkt fix here or at yu kee . Hello it’s me, I am also visiting this web site on a regular basis, this web site is really fastidious and the viewers are actually sharing nice thoughts.